This is a summary for Brinley’s 35th week. She was 34 weeks old. She also turned 8 months old this week! She was super happy this week. Supply was good and she ate for all four feedings this week. It is still hard to get her to focus and eat at the fourth feeding, though. She does it, but she is super distracted. Her second nap extended this week, which is a result of dropping the third nap. For babies this age, they might drop a nap but don’t usually drop time they sleep. They will move it to another nap or to longer night sleep. An older baby who drops the third nap might stay with the same sleep times (but most often they rearrange sleep, too), but young babies definitely need it rearranged. Brinley also started staying awake longer for her waketimes this week. This is another thing that often happens when a baby is ready to drop the third nap. When Brinley wants to get from point A to point B, she just rolls there. I think it is so funny to watch a baby do this! I have noticed that babies this age can really vary in what skills they are developing. I have noticed in general boys tend to be focusing more on the gross motor skills at this age (though girls will, too) and girls tend to be more focused on verbal skills and/or fine motor skills (and boys can do this, too). So while one 8 month old might be crawling, another might be saying a couple of words and another might be super good at picking up those finger foods. Beyond baby’s individual natural progression, parents can have a big impact on what baby learns in what order. 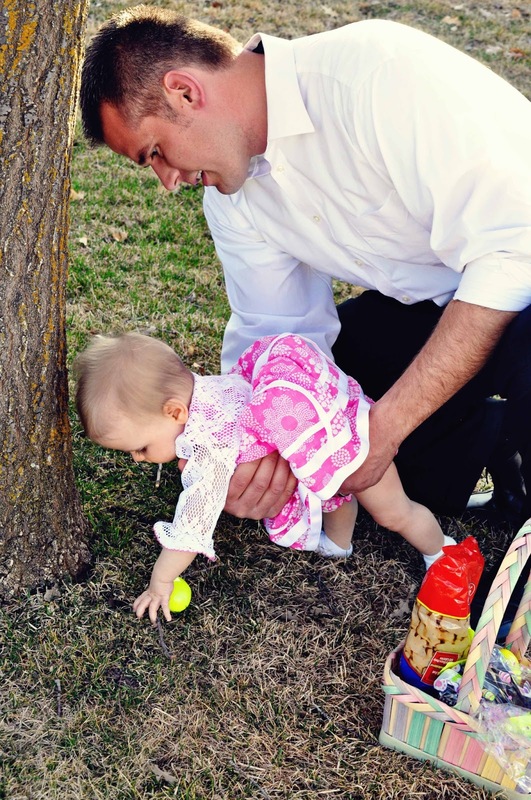 If you rarely put your baby down, gross motor practice will be more difficult. If you don’t feed finger foods, fine motor skills won’t be as developed as the baby who feeds herself throughout each day. This week, we started blueberries. This was a success. No surprise since she has loved every fruit she has encountered so far. I also gave her Cherrios. She likes the name-brand Cheerios and not the Malt-O-Meal. Brinley has a really good pincer grasp. She can pick up those finger foods very well. just curious…does brinley have any teeth yet? my son is the same age, and the only finger food i've given him is puffs (he doesn't have any teeth through yet). My comment is unrelated to anything Babywise 🙂 I just want to say how stinking adorable that picture is, as is her dress! Love it! Thank you Nika! I love that dress, too. I got it at Khols if anyone wants to try to find it for themselves. Now that Brinley doesn't use the swing, what do/would you do if she woke early from a nap? 30 minutes early? Hour early? Even hour and a half early?My daughter is about the same age. She is a great napper, but randomly has a bad nap and I'm not sure the best way to handle them anymore.